Australian Red Claw Crawfish differ from Louisiana crawfish in many ways. They get their name from the red patch found on the males' claws. They do not burrow in the ground like the crawfish that we're most familiar with, nor do they attack each other, except right after a molt. 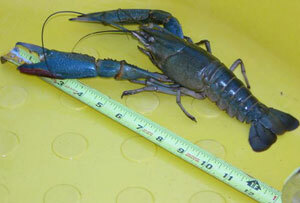 Redclaws grow at least twice as fast as other crawfish and become much larger. After only 9 months in a pond, we caught several at or just under twelve inches long! 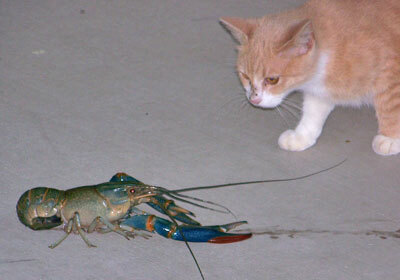 Louisiana crawfish carry a plague that kills Australian crawfish. They can never be raised together. 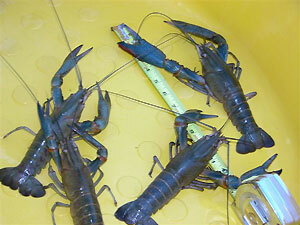 Australian crawfish can not live in water temperatures below 50 degrees. A simple, inexpensive, diet for them is half rabbit pellets, half catfish food. If you are going to keep them in an aquarium, feed sparingly, always use de-chlorinated water and they don't need salt in their water either. These lucky crawfish are owned by Karen. She has created condos and stairs for these animals. 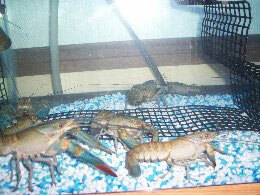 Although Australian Redclaw Crawfish can live their whole lives under water, these critters can crawl out if they want. Karen has had a problem with escapees though - three or four are evidently exploring to this day. It looks like they were able to get out for a "walk-about" up an air hose. They are excellent escape artists, so beware! 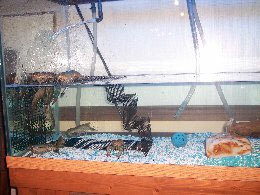 We highly recommend a heavy lid on the tank, and that the area around the filter is enclosed too. PLEASE NOTE: They DO NOT Play Well With Others!